Sarah Sokolovic is an American actress best known for her starring role as Laura Sutton, an American journalist in Berlin who works for the Düring Foundation, in the political thriller television series Homeland. It was her first starring role in television. She previously guest starred on the television drama series Unforgettable and The Good Wife. 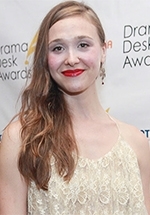 Sarah graduated from Yale School of Drama in 2011.